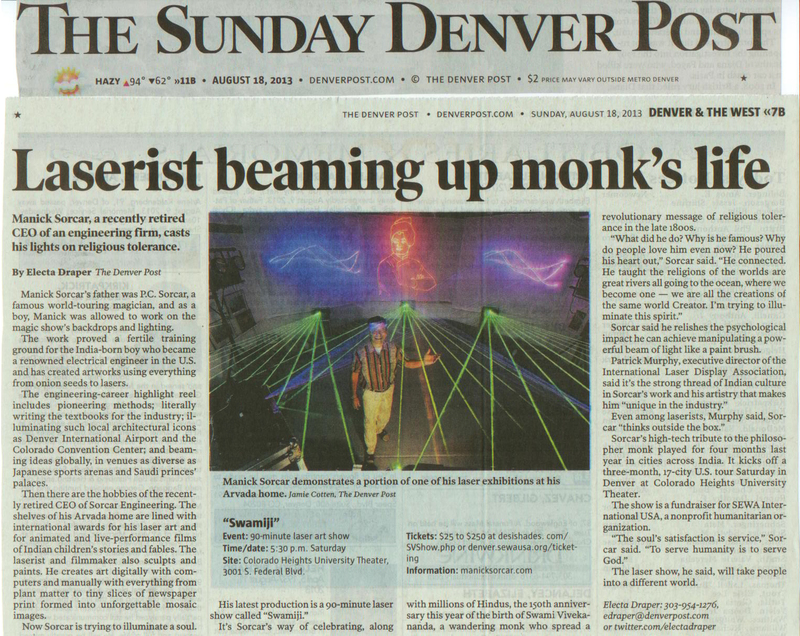 The Denver Post, Colorado's largest circulated and Mile-High City's most popular newspaper welcomed Manick Sorcar's laser show news on Swami Vivekananda, with wide open arms. The news-story, which was in the 'Denver & The West' section with a color picture was written by Electa Draper, a staff reporter of the Denver Post who interviewed Sorcar. 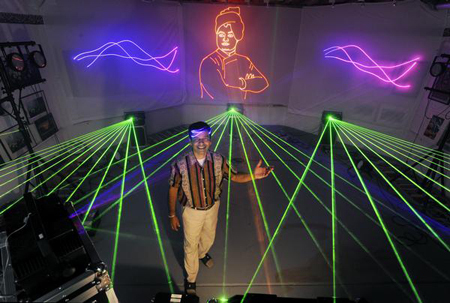 Manick Sorcar demonstrates a portion of one of his laser exhibitions at his Arvada home. Manick Sorcar's father was P.C. Sorcar, a famous world-touring magician, and as a boy, Manick was allowed to work on the magic show's backdrops and lighting. The work proved a fertile training ground for the India-born boy who became a renowned electrical engineer in the U.S. and has created artworks using everything from onion seeds to lasers. The engineering-career highlight reel includes pioneering methods; literally writing the textbooks for the industry; illuminating such local architectural icons as Denver International Airport and the Colorado Convention Center; and beaming ideas globally, in venues as diverse as Japanese sports arenas and Saudi princes' palaces. Then there are the hobbies of the recently retired CEO of Sorcar Engineering. The shelves of his Arvada home are lined with international awards for his laser art and for animated and live-performance films of Indian children's stories and fables. The laserist and filmmaker also sculpts and paints. He creates art digitally with computers and manually with everything from plant matter to tiny slices of newspaper print formed into unforgettable mosaic images. Now Sorcar is trying to illuminate a soul. His latest production is a 90-minute laser show called "Swamiji." It's Sorcar's way of celebrating, along with millions of Hindus, the 150th anniversary this year of the birth of Swami Vivekananda, a wandering monk who spread a revolutionary message of religious tolerance in the late 1800s. "What did he do? Why is he famous? Why do people love him even now? He poured his heart out," Sorcar said. "He connected. He taught the religions of the worlds are great rivers all going to the ocean, where we become one — we are all the creations of the same world Creator. I'm trying to illuminate this spirit." Sorcar said he relishes the psychological impact he can achieve manipulating a powerful beam of light like a paint brush. Patrick Murphy, executive director of the International Laser Display Association, said it's the strong thread of Indian culture in Sorcar's work and his artistry that makes him "unique in the industry." Even among laserists, Murphy said, Sorcar "thinks outside the box." Sorcar's high-tech tribute to the philosopher monk played for four months last year in cities across India. It kicks off a three-month, 17-city U.S. tour Saturday in Denver at Colorado Heights University Theater. The show is a fundraiser for SEWA International USA, a nonprofit humanitarian organization. "The soul's satisfaction is service," Sorcar said. "To serve humanity is to serve God." The laser show, he said, will take people into a different world. Site: Colorado Heights University Theater, 3001 S. Federal Blvd. (End of The Denver Post article).